Europe automotive polycarbonate glazing market is expected to be on the increasing growth trend due to the strict government standards on carbon emission, fuel efficiency and vehicle weight. The European market has many established market players in the automotive industry that have made a huge contribution to the automotive polycarbonate glazing market. The market is expected to propel at a CAGR of 14.68% during the forecasting years 2019-2027. 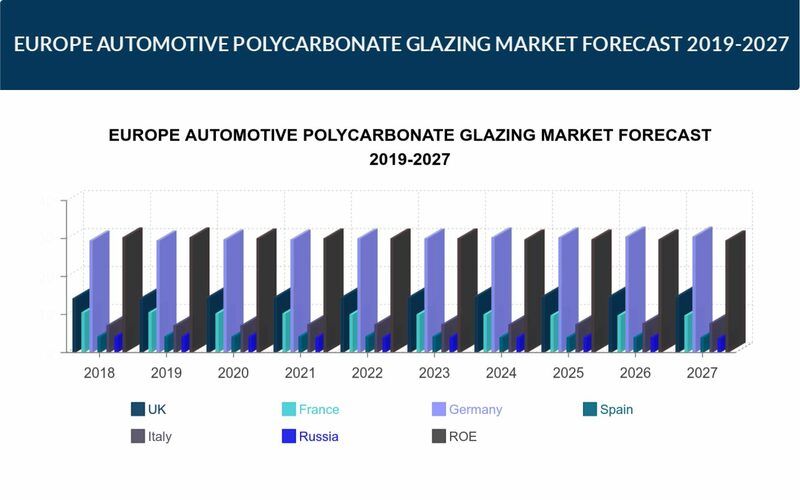 Europe Automotive Polycarbonate Glazing Market by Vehicle Type (Passenger Vehicle, Commercial Vehicle) by Application (Side Window, Front Windshield, Sunroof, Rear Windshield, Large Windshield, Hydrophobic Glazing, Head-up Display, Switchable Glazing) by Geography. The formability of polycarbonate materials allows glazing designers to search for complex and new automobile aesthetical shapes that can go beyond the limitations of glass. For instance, like the new curvatures, 3-D styling, and color capabilities are possible, thus allowing the manufacturers to improve the aesthetics and differentiation of their vehicles. The European market has many established market players in the automotive industry that have made a huge contribution to the automotive polycarbonate glazing market. The market is expected to propel at a CAGR of 14.68% during the forecasting years 2019-2027. Automotive polycarbonate glazing has its application primarily in the automotive sector that include passenger and commercial vehicles. Europe automotive polycarbonate glazing market is expected to be on the increasing growth trend due to the strict government standards on carbon emission, fuel efficiency and vehicle weight. Moreover, growing production of vehicles coupled with the rising adoption of lightweight materials in the automotive sector is also expected to augment the growth of automotive polycarbonate glazing market in Europe. The market is majorly contributed by the investments and adoptions made by the economies of the United Kingdom, Germany, Italy, Russia, Spain, France and the remaining countries collectively forming the Rest of Europe. The eminent companies operating in Europe for automotive polycarbonate glazing market are KRD Sicherheitstechnik GmbH, Idemitsu Kosan Co., Ltd., Sumitomo Chemical Co. Ltd., Chi Mei Corporation, Trinseo S.A., Engel Austria GmbH, Renias Co., Ltd., Sabic, Mitsubishi Chemical Corporation, Teijin Ltd., Covestro AG and Webasto SE.